It's Krupa, and did you ever hear of Art Blakey, Elvin Jones, blah blah...Max Roach? Hello? Not to put you down, but there are whole loads of maniac drummers, and watch out for the ladies and the Brazilians...keep listening and playing, and you'll be lucky if they're not dead before you ever hear of them, but I'm 61, so duh... get it on, do not let up! My son and now baby ganddaughter, gonna be one this month, plays great! Now GO! Love you! 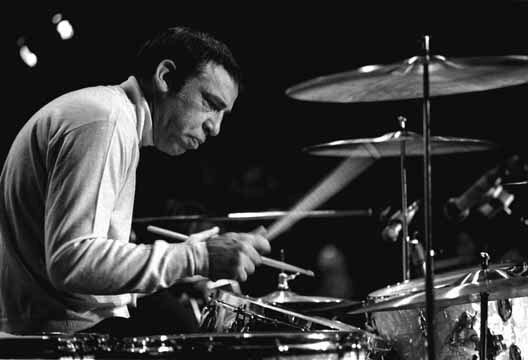 Buddy Rich, Gene Kruppa and Sandy Nelson are 3 of the best drummers ever was. As much as I loved the Beatles, Ringo couldn't hold a candle to any of these 3. Rich was a guest on Johnny Carson many many times. He was one of Carson's favorite guests.